Robertson County District Attorney Coty Siegert recently asked Texas Attorney General Greg Abbott to settle a dispute between Siegert and Robertson County Judge Jan Roe over voting by mail, and I suspect his request will ultimately prompt the Texas Secretary of State to change the application form for mail-in ballots. Meanwhile, the dispute between Siegert and Roe is still reverberating through the courthouse. Back in January, Siegert, a Republican, and Roe, a Democrat, got into a shouting match in the courthouse about whether Hearne residents were illegally registering to vote absentee by claiming that they were disabled. According to Roe, voters could vote by mail if they had any kind of disability (maybe a speech impediment? ), whereas the Texas Election Code defines “disability” as “a sickness or physical condition that prevents the voter from appearing at the polling place on election day without a likelihood of needing personal assistance or of injuring the voter’s health.” See Tex. Election Code 82.002(a)(emphasis added). As it turns out, Roe had hired a convicted felon to recruit potential voters. That campaign worker had been targeting “The Hill” and the Columbus Village neighborhood in Hearne, trying to sign up as many absentee voters as possible, apparently without regard to whether the voters had “a sickness or physical condition that prevents the voter from appearing at the polling place on election day…” After Siegert questioned Roe’s definition of “disability”, Roe reportedly got angry and accused Siegert of trying to suppress the vote. According to Siegert, he said at the time that he had no intention of prosecuting any voters – who would have had good reason to believe that they were qualified to receive an absentee ballot – but only the people who were knowingly inducing voters to break the law. (That happens to be the same policy adopted by the attorney general’s office). Roe, who is not an attorney (even though she is a judge), argued that because “disability” is undefined on the ballot application, she was free to define the term as she saw fit. The legal outcome of the dispute should be a no-brainer. The secretary of state cannot supercede a statute merely by failing to define the term “disability” on the standard absentee ballot application. The law will always trump a postcard, therefore the attorney general will almost certainly agree with Siegert that only a disability “that prevents the voter from appearing at the polling place on election day” is grounds for an absentee ballot. The attorney general will likely recommend that the secretary of state define the term “disability” on the application, and the secretary of state will likely follow the recommendation (in fact, the secretary of state’s office has already filed a brief agreeing with Mr. Siegert’s interpretation of the law). The political side of the equation is a lot more complicated. The neighborhoods targeted by Roe are overwhelmingly black, and absentee voting is as touchy an issue in Robertson County as it is anywhere else. After the confrontation in the courthouse, Judge Roe put an item on the commissioner’s court closed-session docket, and I am told that she was seeking to cut off funds for any legal defense of Siegert in the event that he was sued. Why? I suspect Roe wanted to organize a lawsuit against Siegert in her capacity as a political candidate, then use her role as county judge to limit his ability to defend himself. 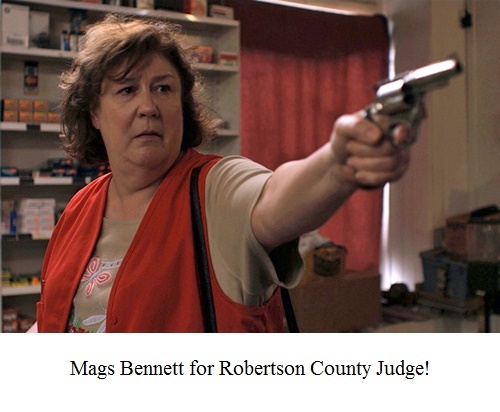 As I’ve explained on BoogerCountyMafia.com and elsewhere on this blog, Roe is a key player in the corrupt Democratic political machine that has ruled Robertson County since the 1800s. Roe is a tall and somewhat thuggish woman, and she reminds me slightly of the character Mags Bennett on Justified. I am informed that Bryan F. “Rusty” Russ, Jr., of all people, had to warn Roe that any retaliation against Siegert could result in a criminal charge of official oppression. After that, she apparently curtailed her attempts to get even. Over the years, I have heard numerous reports of absentee ballots being mailed to vacant lots and vacant houses in Hearne, and even reports of voters arriving at the polls only to learn that someone submitted an absentee ballot on their behalf. Given the long history of endemic corruption in Robertson County, none of that surprised me. Earlier in the year, the AG’s office sent vote fraud investigators to Robertson County at Siegert’s request, and Roe is already suffering politically because of her close connections to Rusty Russ, John Paschall, and the rest of the Booger County Mafia. I have to wonder if that’s what prompted the chairwoman of the Robertson County Democratic Party to make allegations that Roe’s opponent, Charles Ellison, had tried to buy the votes of two voters. According to the Bryan-College Station Eagle, the incident allegedly happened on September 25, 2014, yet the story was not printed until today, two days before the start of early voting. Nelda Calhoun, the local Democratic chairwoman, is obviously trying to create a distraction. According to Siegert, Calhoun invited the Robertson County News to attend the meeting where she presented her complaint against Ellison. The newspaper sent a reporter, but ultimately did not run a story. KBTX reportedly refused to run her story as well. Finally, she convinced The Eagle to run her story. Interestingly, the black community has not rallied to support Roe, even though her scheme was ostensibly designed to increase the number of black voters. The Robertson County Democratic Party has a long history of racism and political corruption, and there are signs that the alliance between the African-American community and the local party has begun to unravel. Stay tuned, because I’ll be blogging about that in the next few days. CORRECTION 10/25/2014: The original version of this post reported that Siegert and Roe “got into a shouting match in the courthouse over Roe’s use of a convicted felon to sign up residents to vote by mail.” I am now told that the dispute in January concerned the definition of “disability,” whereas Roe’s use of the convicted felon was discussed later. The fall of the white Democratic political machine in Robertson County? The most worthless group of pathetic lizards in the State of Texas. I have personally witnessed the Democratic scum in action with stacks of early voting mail ins— all written in the same hand writing. What a bunch of scumbags on power trips to fleece the taxpayers. Write what you want, I do not care. You think? really trying to create a distraction. Well here is some news for you partner. Charles Ellison passed a lie detector test at 3pm this afternoon in Austin. You see, the Robertson County News as well as KBTX had the integrity not to run this story because as explained by Coty Siegert and the AG’s officer, he could not “charge” Ellison until an investigation was completed and would not do so publicly. Both KBTX and myself knew to question the source of the complaint (Calhoun) and take it with a grain of salt. Really? When was the last time you went to the Hill? I go at least once a week. I eat at this wonderful place called Seymors, great food, you should go and see “The Hill” for yourself. Call me, I’ll give you a ride. Truth is, historically in Robertson County the African-American vote has been democratic. Including the last election where John Paschall in fact beat Coty Siegert, though not by much. Jan Roe had nothing to do with this Ellison situation, nothing, in fact it was Calhoun that contacted me, not Roe. It was a meeting with Calhoun, Siegert and I, no where in that room was Roe. How can you speak for the African-American voter on “The Hill” or even comment on their state of mind with regards to the election? I can tell you this, I have never seen you on “The Hill” and I bet you have never even drove in teh neighborhoods of Hearne. I’m here, in Hearne, Texas. Where are you? Perhaps you might consider focusing your attention on something you know about because I’m 100% sure you have no idea on the voting state of mind of the African-Americans of Hearne. 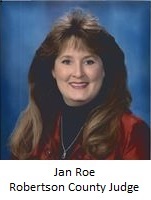 You removed the photo of Jan Roe because you did not have permission to use it. Paint whatever picture you like (or take one from my personal facebook page) there is nothing I need to post or write. Mr. Clevenger, the photo you have displayed on your website of Jan Roe was taken by the Robertson County News, by Publisher Dennis Phillips. You do not have permission and have stolen that photo from the newspaper. Remove the photo immediately as you do not and will not receive permission to use this photo.